O most sorrowful Mother Mary! I remind thee of the intense pain which pierced thy soul when thy beloved Son took leave of thee on Maundy Thursday. Remember how the sword of pain pierced through thy soul, and what burning tears thou didst then shed. I pray thee, O Mary! befriend me when I take leave of my friends and my soul is about to part from my body in the bitterness of death, that the enemy may have no power over me. Amen. Hail Mary. O most sorrowful Mother Mary! I remind thee of the intense pain which pierced thy soul when St. John brought thee the news that thy beloved Son had been shamefully betrayed, taken captive by the Jews, bound, struck, pushed, dragged first to Annas, then to Caiphas, and there, like a lamb amid wolves, was held as prisoner and falsely accused. Remember, O Mary! what a sword of pain then convulsed thy soul, and what burning tears thou didst shed. I pray thee, O Mary! in my last hour, when my heart is full of anxiety and pain, strengthen me and console me by thy presence, and preserve me from falling into discouragement. Amen. Hail Mary. O most sorrowful Mother Mary! I remind thee of the intense pain which pierced thy soul on Good Friday when thou didst see with thy own grieving eyes how Pilate presented thy dear Son to the people and said: "Behold the Man!" Remember, O Mary! what thy tender heart suffered, as thou didst behold thy sweetest Child so terribly disfigured that thou thyself wouldst scarcely have known Him. What didst thou think, O best of Mothers, when thou didst see His angelic countenance so frightfully disfigured, covered with blood and spittle, His head crowned and His whole Body lacerated so that it no longer resembled that of a man! Speak, O Mary! What did thy heart suffer when thou didst hear the Jews tumultuously exclaim: "Crucify Him, crucify Him!" and didst then hear Pilate pronounce that most unjust sentence! Through these most bitter pangs which lacerated thy maternal heart, I beg thee, O Mary, when I am called before the severe Judge to give an account of my life, do thou unite thy great merits to my scant record of good works, that I may receive a favorable judgment. Amen. Hail Mary. 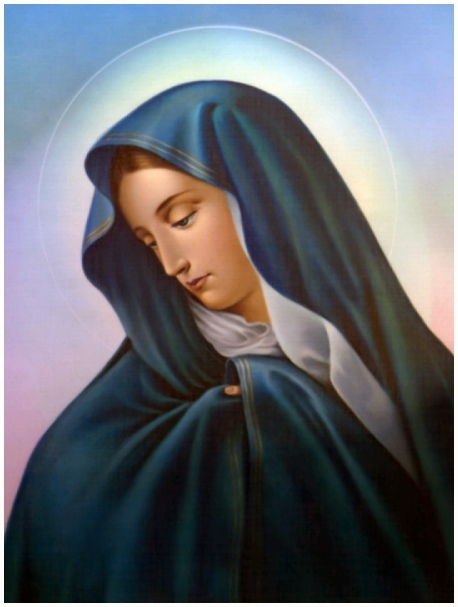 O thou most sorrowful Mother Mary! I remind thee of the intense pain which pierced thy soul when thou didst meet thy innocent Child, laden so heavily with the hard wood of the Cross, completely exhausted on the road to Golgotha, where like a tender Iamb He was to be slaughtered. O most sorrowful Mother! what a martyrdom it was for thee to see Him sink under His burden, yet still driven on- ward by the executioners with thrusts and plows! O holy Virgin! through thy maternal heart thus pierced through and through by the sorrowful spectacle of beholding His Cross, I beseech thee that at my going hence thou wouldst turn thy merciful eyes toward me, that in my last agony I may be consoled and strengthened by the light of thy face. Amen. Hail Mary. O most sorrowful Mother Mary! I remind thee of the intense pain which wrung thy soul when thou didst hear thy beloved Son being most inhumanly fastened to the Cross by large nails driven through His hands and feet. O most loving, most sorrowful Mother! how painfully must every blow of the hammer have struck upon thy tender heart. What wounds must thy heart have received! Through these thy suffelings, and through thy burning tears and sighs which penetrated even to Heaven, I pray thee not to forsake me when I lie in my last agony and the arrows of death are piercing my heart. Amen. Hail Mary. O most sorrowful Mother Mary! I remind thee of the intense pain which pierced thy soul when, raising thy eyes streaming with tears, thou didst see thy beloved Son hanging on the Cross in unutterable torments and didst be,. hold His enemies triumph over Him with mocking taunts and blasphemies. How must thy heart have been torn at hearing the words: "My God, My God! why hast Thou forsaken Me?" O holy, anguished Mother! think how desolately thou didst stand beneath the Cross, when thy Son cried out: "It is consummated." "Father, into Thy hands I commend My Spirit!" Oh, the anguish and sorrow of thy mother-heart when thy Son died upon the Cross! I pray thee, through the bitter death of thy well-beloved Son, assist me at the hour of my death, take my poor soul into thy hands and present it to thy Divine Son. Amen. Hail Mary. O most sorrowful Mother Mary! I remind thee of the intense pain which transfixed thy soul when a spear penetrated the lifeless Heart of Jesus! Then thy loving Heart was pierced through and through! O grief-stricken Mother! what didst thou experience when, after the dead Body of thy Son had been taken down from the Cross, It was laid in thy virginal arms and bathed with thy tears! What didst thou not suffer at beholding the large Wounds in His hands and feet! What didst thou not feel at beholding that Divine Countenance so disfigured that thou couldst scarcely recognize it! Might not thy pangs have softened stones and moved irrational beasts to compassion? Therefore, O most compassionate Mother, by all these thy sorrows, I entreat thee to have pity on my soul in my last sorrow, to cleanse it with thy tears, to take it in thy arms as thou didst once take the Body of thy Divine Son, and lead it to eternal felicity. Amen. Mary , most sorrowful, Mother of Christians, pray for us. O Mother of Sorrows, by the anguish and love with which thou didst stand beside the Cross of Jesus, stand by me in my last agony. To thy maternal heart I commend the three last hours of my life. Offer these hours to the Eternal Father in union with the agony of our dearest Lord. Offer frequently to the Eternal Father, in atonement for my sins, the Precious Blood of Jesus, mingled with thy tears on Calvary, to obtain for me the grace to receive Holy Communion with most perfect love and contrition before my death, and to breathe forth my soul in the actual presence of Jesus. Dearest Mother, when the moment of my death has come, present me as thy child to Jesus; say to Him in my behalf: "Son, forgive him, for he knew not what he did. Receive him this day into Thy kingdom."